The fluffy ball in the image above is actually a variety of the common domestic rabbit, called Angora Rabbit. Angora rabbits are mainly bred for pet-companions and for their long and soft wool which has numerous applications. Their origins hold from Ankara (also known as Angora), Turkey. They are docile,active, social and playful animals enjoying the attention of both their owners as well as the companionship of other rabbits. 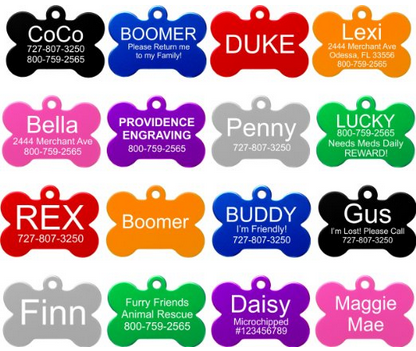 These attributes make them an excellent option for anyone who wishes to have a pet that is a bit out of the ordinary. They can live for about 5–7 years under good hands. Now let's learn a few basic things about some of the most popular varieties. English angora rabbits have a weight of about 2 to 3.5 kg (4.4 to 7.7 pounds) and are the smallest ARBA-recognized variety. They look a lot like teddy bears. Their bodies are entirely covered by rich fur, except for a small area above the nose and front feet. They are very gentle animals, making them perfect companions as long as you have enough time to groom them. Their very dense wool needs to be groomed twice a week. They can be bred to have broken colors, like white with black spots. However, this is not accepted by ARBA standards, something you shouldn't care unless you wish to participate in any of their shows. ARBA has some other restrictions, for instance toenails with only one color. German angora rabbits have a varying weight of 2 to 5 kg (4.4 to 12 pounds). Most of them are ruby-eyed white or albino, although there are a few black individuals. They are very common in USA and Canada, despite not being recognized by ARBA. It is the only variety that can't shed its coat, and thus needs to be sheared. Many hand spinners have bred this variety with other colored Angora varieties (or even breeds) in an effort to get color in the more dense non-matting German-type wool. The resulting offsprings are called German crosses. There is a special organization for them, called the International Association of German Angora Rabbit Breeders (IAGARB). The association recognizes colored (hybrid) rabbits, and they may achieve a German registration if they conform to the IAGARB standards and prove their wool-bearing ability by passing the judges' 90-day wool shearing tests. You can use the second link in the references section to learn more about the various criteria IAGARB uses. French angora rabbits are one of the largest breeds, with a weight of 3.5 to 4.5 kg (7.7–9.9 pounds). They are distinguished by their big undercoat, hairless face and minor tufting on the rear legs.. When the wool has the correct texture, the French Angora rabbit requires less maintenance than most Angora breeds do. 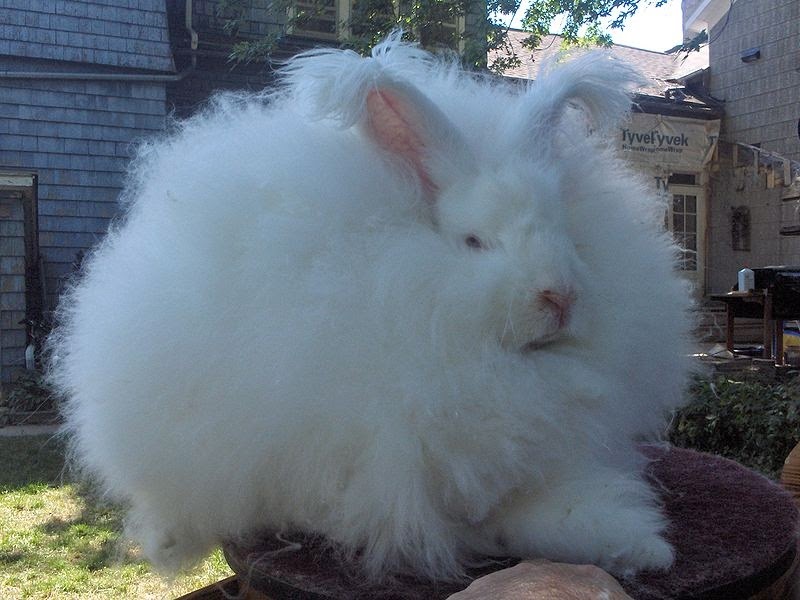 This is the largest angora variety accepted by ARBA. These rabbits weigh on average 5.5 kg (12.12 lb), although certain individuals exceed this weight by far. 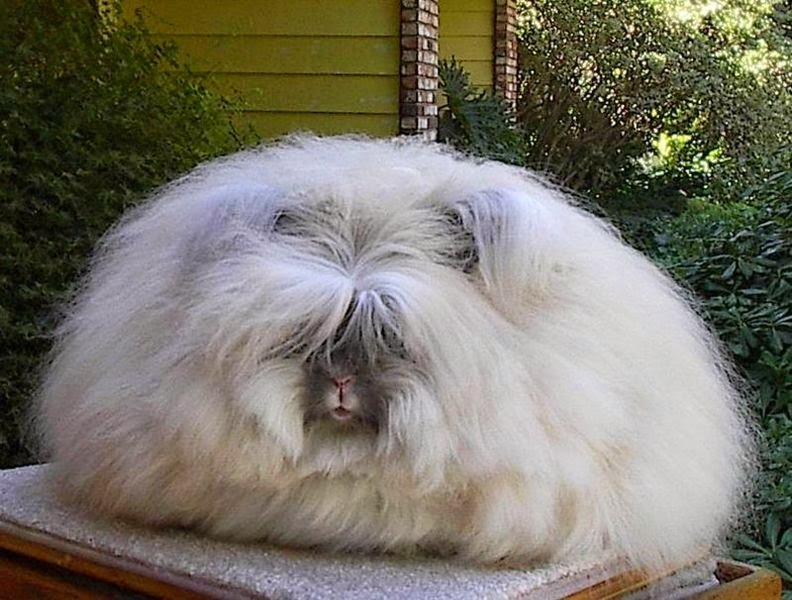 The giant angora variety was created by Louise Walsh, of Taunton, Massachusetts, in response to the ARBA’s refusal to officially accept the German breed, because their body-type was too similar to other breeds. Walsh created this variety using German angoras, French lops, and Flemish giants. After several years, the ARBA accepted it as a breed. Satin angora rabbits take their name from the high sheen of wool they feature, usually referred to as "satinized". The hair shaft has a semi-transparent outer shell and reflects light, resulting in deep color, high luster, and extreme soft texture. 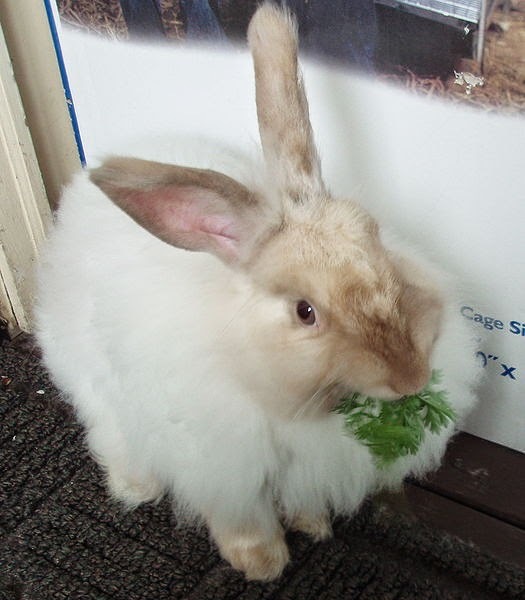 The variety was derived by cross breeding the Satin breed with French Angora rabbits. It resembles the French Angora, except for having no furnishings on the face, ears, or feet. Unlike the English variety, it is relatively easy to groom, although the soft texture makes matting an issue. Daily combing is highly recommended. Rabbits can be trained to "answer" their name and with proper training can even learn to do their "business" in a specific location, which makes cleaning up much easier. In general, they are considered to be more intelligent than guinea pigs and hamsters. 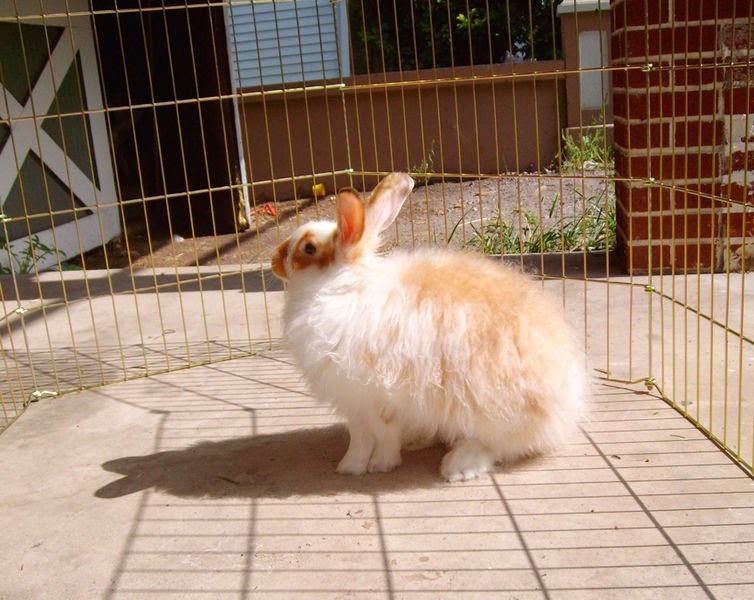 However, unlike normal rabbits, angora rabbits need some special attention. You must be willing to groom them on a regular basis or have someone else do it for you. Not grooming an Angora rabbit comes with a lot of hazards. For instance, an ungroomed individual is in high risk of ingesting its own hair, which in turn may lead to wool block (intestinal blockage). This is a very serious condition that may lead to death. It's no surprise that with all that wool, all Angora varieties are very heat sensitive. Air conditioning (or other means of controlling temperature) may be a necessity, depending on the climate of your area. Just make sure you consult with an Angora rabbit-specialist before buying one. It will be a shame for your new pet to suffer simply because you don't know how to treat it properly! 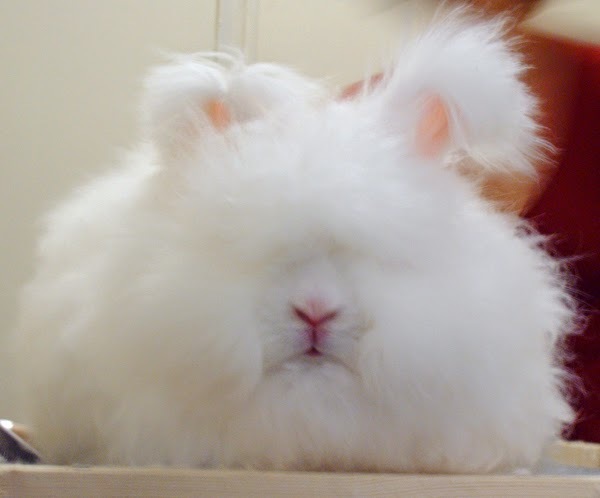 - English Angora Rabbits are the only rabbit breed with hair covering the eyes. they are so adorable !!!!!! i would steel one from someone !